Hobie 16 South Americans: Mex, Bra & Ven secured Panams qualy. Images by Assoc Brasileira de Hobiecat. 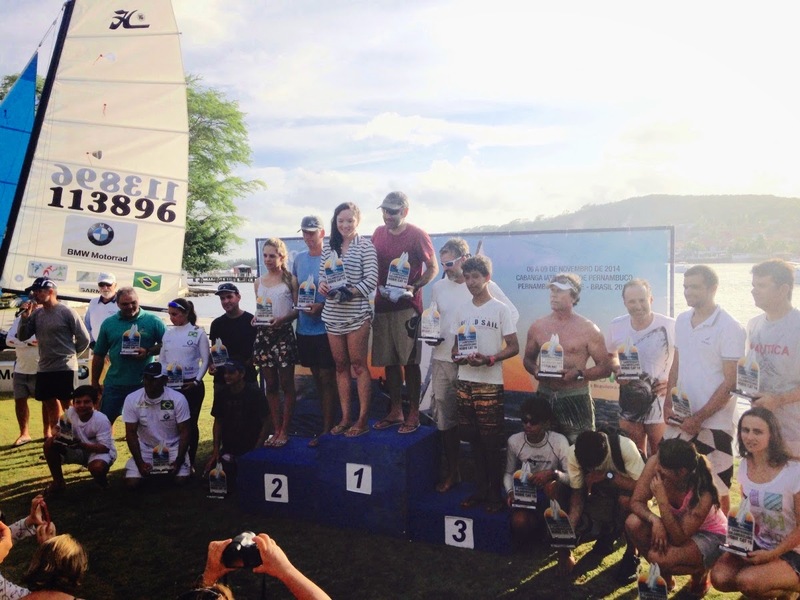 - Armando Noriega & Andrea Dutton maintained lead also in the 3rd Day of the 2014 Hobie 16 South Americans & Panams 2015 Qualifier. Noriega is a long time Hobie sailor , former North American Champ and Panam Silver medalist with his Sister Pamela, who also is female World Champ 2004 sailing with her mother. Armando Sr is one of the leading forces of the Mexican and Caribbean Hobie Class. With that pedigree Mexico went to Pernambuco, Brasil searching for a spot in next Panams putting pressure to the South American countries looking aiming for the same goal. Brasil put two crews in qualifying position and Venezuela got the final assigned spot, along Mex, US, Guatemala, Puerto Rico & Canada will participate in Toronto. The effort was not enough for the rookie Argentine crew against some of the top riders in the continent.